You are currently viewing the European Union version of the site. I’ve seen a couple of mentions recently about artists using Polydraw Drafting Film. Is it possible to let us have information on this product please and how it works? It seems to be very accessible to buy, but without much information about it. Anne Kerr (www.annekerrartstudio.com), who will be writing a drawing series for LP in 2019 replies: There are several makes of drafting film, but as far as I know they are all very similar. Drafting film is 100 per cent polyester, very strong, will not rip easily and is archival. It will not yellow or fade over time. It is very different from other drawing or painting papers and there is quite a steep learning curve when using it for the first time. Welcome to the November issue of Leisure Painter. 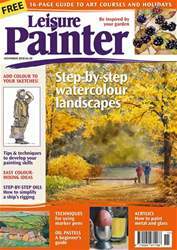 Aimed at amateur painters, who want to make the most of their painting time, Leisure Painter is the UK's best-selling practical art magazine. Within this issue you will find tips and techniques for filling an illustrated journal and how to set yourself regularly painting challenges. There are painting projects from photographs to try, and step-by-step demonstrations for painting buildings, autumn leaves and landscapes in watercolour; still lifes, wildlife and trees in acrylics; and a detail from a ship's rigging in oils. Learn how to add colour to your sketches, follow a beginner's guide to working with oil pastels, and have fun using new coloured marker pens. Enjoy your month of painting with Leisure Painter.